If you're looking for a protein that delivers exactly what you need, you do want to settle anything less than the standard; The Gold Standard. Optimum Nutrition's attention to detail when formulating Gold Standard Whey. Whey protein isolates being of the purest forms of whey that currently exist, rate highly among the best proteins. This is why its seen first on the label for gold standard whey. With whey isolate being the base of this formula and alongside ultra-filtered whey concentrates, Gold Standard whey packs 24 grams of protein into every serving. But the attention to detail doesn't stop there. ON also makes mixability and flavoring a priority. So you can meet your nutritional requirements and enjoy them too. Nonessential Amino Acids-Aspartic Acid 2508, Serine 1126, Glycine 412, Alanine 1180. Blender: Add one scoop of On Gold Standard Whey to a blender filled with 6-8 fl oz of your favorite beverage. Blend for 20-30 seconds. Add 1-2 ice cubes then blend for an additional 30 seconds. Shaker: (Easier: quick and convenient) Fill a shaker bottle with 6-8 fl oz of your favorite beverage. 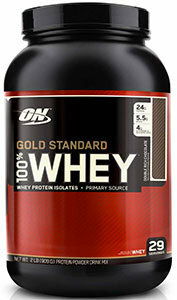 Add one scoop of On Gold Standard Whey. Cover and shake for 25-30 seconds. Enjoy. Glass and Spoon: (Easiest: fast and simple) Simply add one scoop of ON Gold Standard Whey to a tall glass. Add 6-8 fl oz of your favorite beverage. Mix with a spoon for about 20 seconds or until powder is well disbursed. Store in a cool, dry place. Think Outside The Glass: Gold Standard Whey can be used for more than just protein shakes. Try mixing a scoop of Gold Standard Whey into oatmeal, yogurt, or the milk that you pour over your morning breakfeast ceral. Better yet, increase the protein content of muffins, cookies, brownies, etc. by adding a scoop or two to your baked goods recipes. Shake Up Your Shake: By adding a few high-energy ingredients to your shake you can blend up a delicious meal: try adding Fresh or Frozen fruits ( strawberries, bananas, etc. ), peanut butter, flaxseed oil, unflavored yogurt, coconut, slivered almonds, or other ingredients. Stack Your Shake: By adding other supplements including creatine, glutamine, taurine you can make an even more powerful post- workout recovery product. The best place I've bought suplements! Great price and super fast delivery to Brasil!!! Whey com melhor custo beneficio! Tenha um dos melhores Whey na mão e com o preço de custo beneficio, recomendo. Como todos sabem whey protein pra quem busca ganhos em massa é indispensável, para os praticantes de musculação e exercícios em geral não pode ficar sem, faço uso todos os dias para minha suplementação. Um perfeito produto e o preço esta bom. Este com certeza é o melhor whey protein. Já sou cliente da loja há algum tempo e posso dizer que a SameDaySupplements é demais! Good afternoon Sameday team, I come here to thank, today I received the purchase mimha, exactly in the place informed. Thanks for the seriousness, commitment, transparency and honesty. Keep it up, you will surely grow as a company. Thanks for the little toast! Thank you for taking care of my simple requests, such as not sending in a big box, and no box with marks, so for us Brazilians that we import, it helps a lot if we are to be taxed. Of course I will become a more loyal customer from now on. I will not be able to take advantage of this discount coupon that I was kindly sent by the deadline. If possible I would like to receive another so that I can buy again. What to say about the best whey protein I've ever had? Simply amazing!!! Melhor suplemento da atualidade, muito bom mesmo o suplemento. Entrega super boa, e recomendadíssimo o site. Hello Same day supplements !!! I would like to thank you for the work and speed of delivery, as the delivery is very important for customers, I am very grateful for the purchase I made with the company and well satisfied. Simplesmente o melhor wey que existe, o mais puro, a melhor matéria prima para construir musculos. Us dos melhores whey que já tomei muito top e muito leve não pesa no estômago recomendo. Gold standard whey it's a consolidated brand, with a great cost x benefit, it has some great taste, in particular this one has some cookies that really improve the taste. We have a large selection of in-stock OPTIMUM NUTRITION products including Whey Protein items and others for the lowest prices at SameDaySupplements.com® It's always easy to shop for Gold Standard Whey Protein By Optimum Nutrition at SameDaySupplements.com® because you can browse by reviews, brand, prices or search for specific ingredients using our search tool. In-stock orders placed before 3pm EST ship out the same day to USA, Brazil, United Kingdom, Canada, Germany, Australia, Japan, India, France and worldwide at the cheapest prices online.